As the holiday season moves into full steam ahead mode, we thought we’d take a look at one of our fan’s favorite horse jewelry gift items: the Horseshoe necklace. Horseshoe necklaces are a perpetual favorite: a simple, classic design that’s undeniably equestrian. The fact that horse shoes are good luck? Just makes the whole thing better. Best of all, there are so many types and styles of horseshoe necklace that there’s a perfect choice for everyone! Want to knock someone’s socks off this holiday season? Check out this 14K White Gold and Diamond Designer Horseshoe Necklace. That sparkle comes from .28cwt of fine diamonds. The horseshoe is a smidge over 1/2″ square, beautiful at the neckline and appropriate for every setting. There are matching earrings available as well. This is the horseshoe necklace for the horsewoman with a sparkling smile and bright personality, who loves the finer things and classic design. Another great diamond horseshoe necklace is this Diamond Horseshoes Trio Necklace. 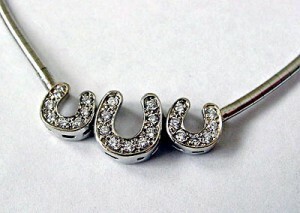 One larger horseshoe is flanked by two smaller horseshoes: all are set with beautiful, sparkling diamonds. This is a contemporary style that is favored by fans of modern design. The horseshoes are hinged so they move with you, and the Omega chain is both striking and of the moment. 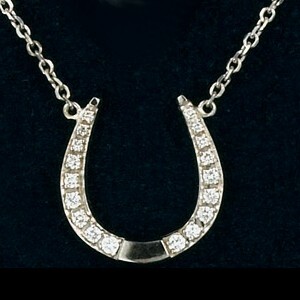 And of course, we have to have a horseshoe necklace for our estate horse jewelry fans. I’ll tell you, it was hard to pick just one! Horseshoes have been such an iconic part of fine horse jewelry, and we’ve got some lovely Victorian pieces that would be sure to delight anyone. But when it came right down to it, I couldn’t resist sharing this Antique Horse Head in Horseshoe Locket with you. Just look at the detailing on this thing! 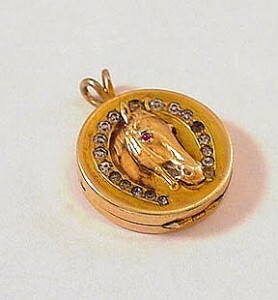 Those are rhinestones in the horseshoe, and there are red jewels for the eyes on this gold filled locket. 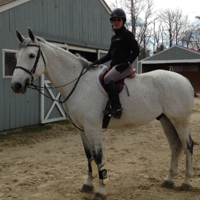 I love how the ears poke forward, the sure sign of a horse who is excited and ready to start the day’s adventure.